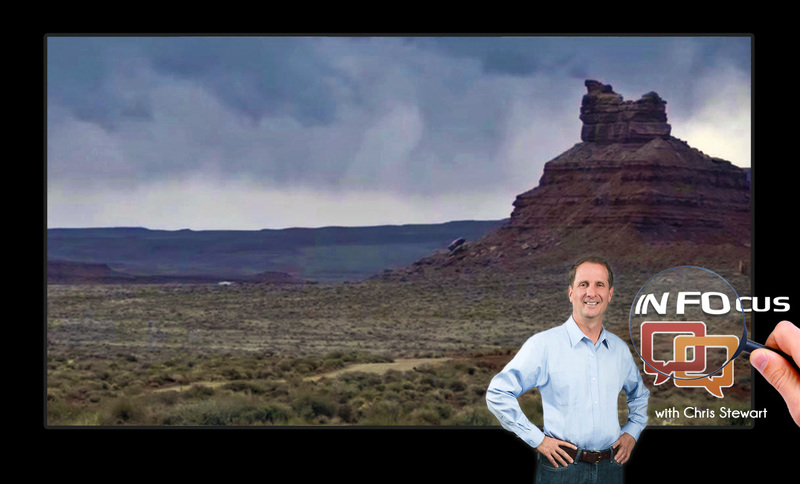 ST. GEORGE – Congressman Chris Stewart is singing the same tune as his Washington colleagues and most of his constituency when it comes to the proposed designation of another national monument in Utah. Located in San Juan County, Bears Ears is being considered by President Barack Obama as prime real estate for a 1.9 million-acre national monument. However, unlike former President Bill Clinton, Obama says he won’t even consider it without local input. To show the federal government’s commitment to getting participation from the state, Secretary of the Interior, Sally Jewell, visited southeastern Utah last month to hold a three-hour meeting focused on gathering feedback. The meeting had more than 1,500 people in attendance reportedly lending to a heated discussion among those in the room. Jewell was tasked with taking the information garnered from the meeting back to Washington, D.C.
During a recent interview exclusively with St. George News, Stewart discussed the proposed designation and his concerns. While Utahns are largely in opposition to the monument, he said he does not believe their opinion will matter. See video of our Chris Stewart interview top of this report. Utah Policy reported last May on a poll that found only 17 percent of Utahns want Obama to declare the Bears Ears area in Southeastern Utah a national monument. The poll, conducted by Utah-based public opinion pollster Dan Jones and Associates, was in stark contrast to one taken by an environmental activist group showing an overwhelming number of Utahns want to see Bears Ears protected under national monument status. Several environmental groups also maintain the designation of the monument is largely supported by Native American groups of the Bears Ears area and within the state. Stewart, however, argues that is not true. Stewart said if the president is sincere he will listen to local input and not create the monument. Stewart recently added a Monument Prohibition Amendment to the House Interior Appropriations Bill aimed to block the creation of new national monuments in Utah and other areas. The amendment, passed during a U.S. House Interior Appropriations Committee Mark Up and later the full House of Representatives, was written in anticipation of Obama’s actions to designate the monument, Stewart said. He added that while he is a strong supporter of preserving the country’s national treasures, he believes in local input. Rep. Rob Bishop recently proposed legislation in a massive bill called the Public Lands Initiative that addresses the Bears Ears area and proposes an alternative to the monument. Dubbed by many as the “Great Bargain,” the legislation has been in the making for three years before being unveiled last month. In the proposed legislation, Bishop proposes splitting 1.4 million acres of the Bears Ears region in two that would be managed as separate national conservation areas. The southern portion would be set aside for traditional Native American uses while the northern section would recognize existing outdoor recreation uses such as rock climbing in the Indian Creek corridor. The bill is slated to be the subject of a formal hearing this month by the committee Bishop heads, the House Committee on Natural Resources. The committee is also planning a markup session on the bill in September where congressional members debate, amend, and rewrite proposed legislation. In 2012, the Utah Legislature passed and Gov. Gary Herbert signed into law the Transfer of Public Lands Act, House Bill 148 in that session. The law demands the federal government relinquish the public lands to state ownership. Similar legislation has been passed in neighboring states of Arizona and Nevada. It failed in Colorado. Since then, Utah has discussed suing the federal government to force its hand to make the transfer and has set aside $4.5 million earmarked for that purpose. In regards to the state’s action, Stewart said he is in favor of anything Utah can do to realize this objective. He added that he and his fellow colleagues in Washington largely leave the handling of this lawsuit to state leadership. Meanwhile, Stewart works from the nation’s capital to find ways through legislation to cede ownership of federal lands to the states. The recent formation of the Federal Lands Action Group is one of Stewart’s many efforts in this regard. Stewart and Bishop launched the Group last April to develop a legislative framework to build on the work started by Utah, according to information on the Group’s website . According to a press release issued last April from Bishop’s office, the group was created to cede ownership of federal lands to the state. “This group will explore legal and historical background in order to determine the best congressional action needed to return these lands back to the rightful owners,” Bishop said in the release. Opponents to the transfer argue the action would result in public lands being sold off to the highest bidder and put some of the nation’s most iconic and scenic landscapes at risk of being lost forever. They also dispute the idea that public access would be increased arguing that as more lands are privatized, the public would be cut off from these areas. Stewart, along with the rest of our “drill baby drill” representatives REALLY need to go! They are certainly an embarrassment for Utah. Yeah Bob sets a really good example of what Utahns are like ! The meeting with Sally Jewell in Bluff to get “local” input was the biggest farce in the history of our county. 11 busloads of outsiders some from as far away as Texas, were brought in to support the creating of a National Monument and the local voices were mostly pushed aside. Many of the outsiders didn’t even know where the Bears Ears is located and said they came for the free trip, T-shirt and and a trip. The big money behind the monument is pushing this and the locals will have no say. Sally Jewell even called the area they want to make into a monument, “pristine” and said they want to keep it that way. How is making it into a National Monument, advertising it and bringing in millions of tourists, going to protect it? It is pristine for a reason. Let’s keep it that way. The forest service and BLM already manage it and have done a great job. The water we depend on to live here is included in the monument boundaries and we still have many years when we struggle to have enough, even to the point that they restrict all outside watering. If they take control of the water, how will we survive, let alone handle the influx of all the tourist. There isn’t enough water to handle millions of tourists. I say to all those who want the monument, Let them have 1.9 acres of land where you live instead.